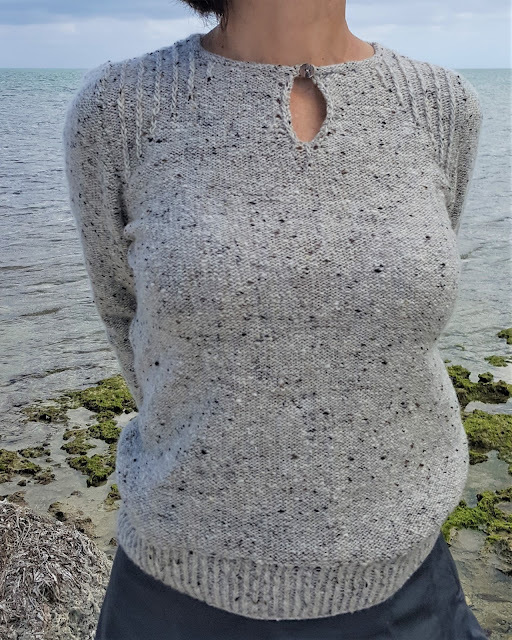 The main difference between a process knitter and a finished project knitter is their goal. For process knitters it is enough to have something in their hands – preferably warm, soft, and beautiful yarn – but for some any yarn would suffice as long as they are making something, anything from it. The first obvious choice of a project for this kind of knitters is a blanket: no particular shape, no decreases/increases, and almost no finishing. Pure mindless knitting. And if it is done for a good cause (charity, gift for a new born, or any gift for that matter) it makes the whole process much more meaningful and gives you moral satisfaction, a considerable bonus to your previous mindless knitting. The other group of knitters’ main goal is to make something that could be worn by a human being therefore it must have a particular shape and fit the aforementioned human. This path is thorny, full of traps, and ambushes. Sometimes it reminds me of a minefield where a knitter, a de-mining specialist, a bomb diffuser, slowly and painfully gets to the end. 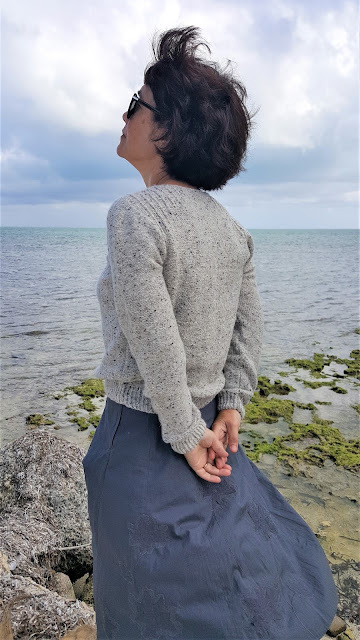 I am not surprised anymore by the high level of anxiety and fretfulness exhibited by many knitters that I know – after all they put a lot of time, effort, and a good deal of money (we all love expensive yarns, don’t we?) into a project that might turn out a complete disaster. 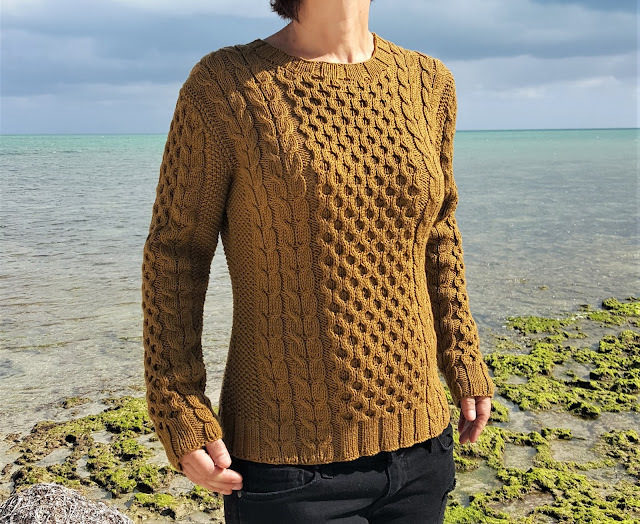 Over the years I’ve been a process knitter and a finished project knitter depending of the circumstances of my life and I definitely can see the appeal of both ways. Yet, I don’t think that the process knitters would be interested in my ramblings here. 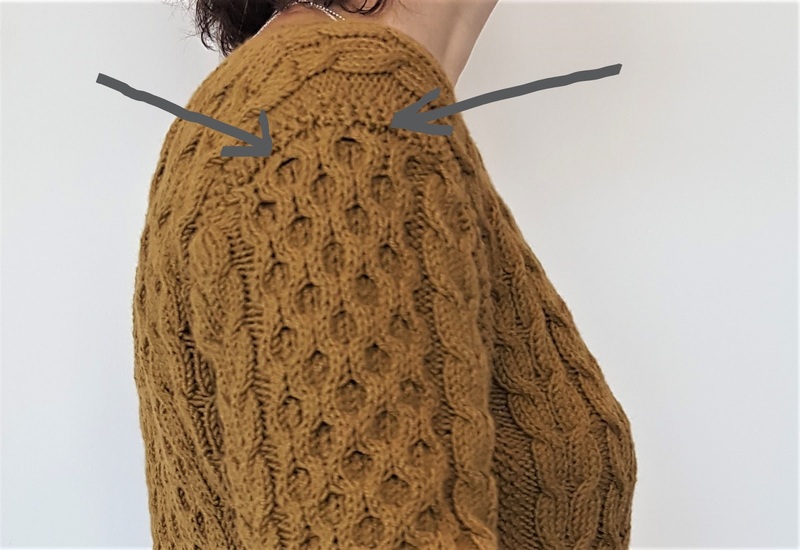 Today I am sharing some of my “knit-hacks” that can prevent disappointments and help with “troubleshooting” in case you pick the same patterns as I did in January. My first finished project of the new year was Silver from Kim Hargreaves’ book Grey. I bought the yarn - Rowan wool cotton – years ago because of its color. It was the time when I was knitting mostly to feel something in my hands and when seamless projects just started popping up in knitting magazines. 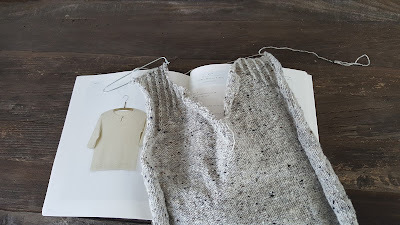 I picked this cardigan by Carrie Bostick Hoge from Classic Elite pamphlet # 9096 and made it in no time. It was worn only once because the fit was horrible. It made me look like a hunchback and a dwarf without legs. 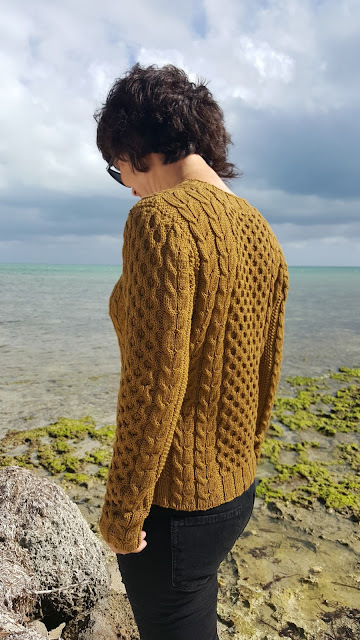 Everything was wrong – the length, the width, the flopping and awkward fronts that I was never able to close or at least to straighten (they kept curling like on the Ravelry pattern picture). The whole cardigan was a mess but the color was still great. It was obvious that this yarn with its wonderful stitch definition should become something completely different, with shape and form. So I unraveled, washed, and balled it, and then started looking for a perfect project for it. 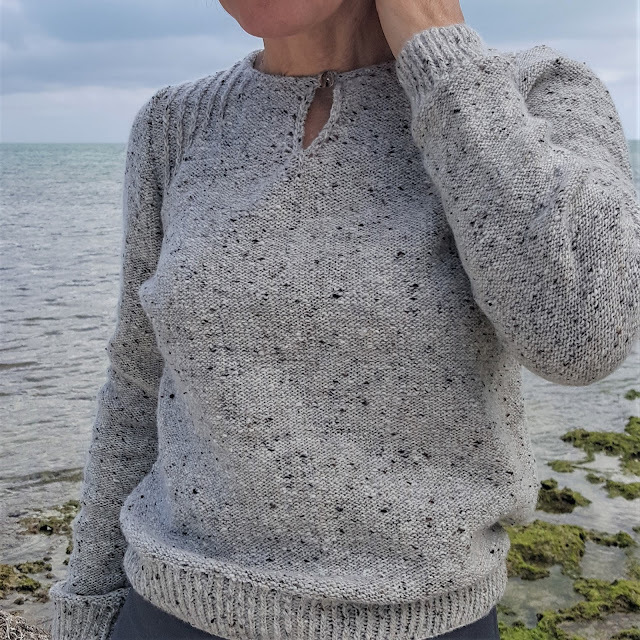 Finally, last summer, when Grey by Kim Hargreaves was first published, I decided that Silver – a fitted cabled jumper from this book – could be the right choice. Being a knitter with many years of experience I could tell right away that this pattern was tricky. Why? Because of the cables, of course. They are beautiful and not too difficult to make, but they add bulk to the garment. And this one is supposed to be fitted. So it would cling to your tummy and the beautiful cables would give it more volume than you need. No matter how fit and trim you are, this kind of jumper will give you a bumpier belly than a plain one. Plus its length was a real problem for me. If I want to wear something fitted and accentuate the waste area the garment must be no longer than 36 cm/14.5” otherwise I look like a tiny sausage with short legs (I am 5”2’). 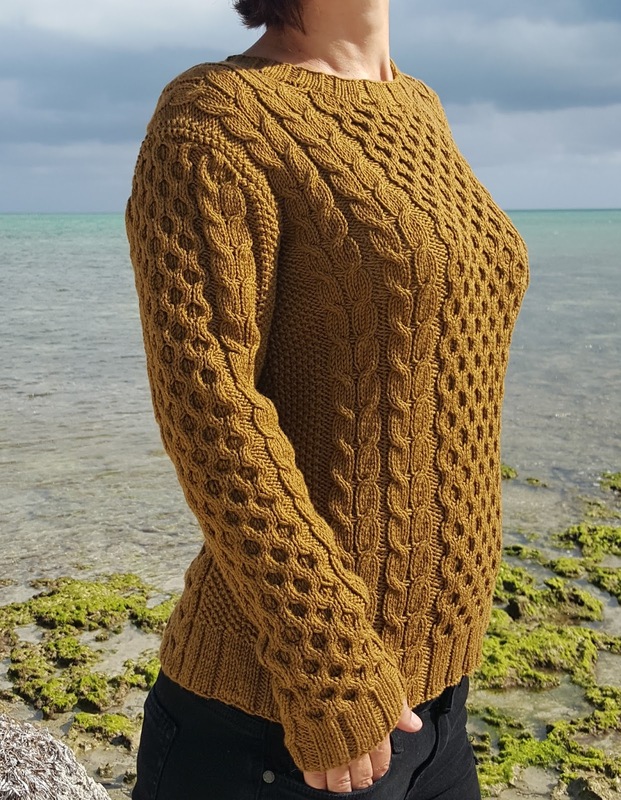 I came to this formula after many unfortunate knits that I had to get rid of for only one reason – they looked awful on me. The obvious solution in this particular case was to make the sweater shorter and a size or two bigger. Yet, I had only 10 balls (1240 yards) for my initial garment, now even less after unraveling (don’t forget that this yarn is discontinued) and Silver requires 10 balls of Rowan Alpaca Soft DK (=1370 yards) for the smallest size. I didn’t want to make the smallest size but making a bigger size I could run out of yarn. In a way it was a gamble and my level of anxiety went through the roof. I was weighing each finished part and the leftovers of the yarn all the way till the end. It made me work faster because I wanted to be sure that I’ll have enough yarn to finish the garment. Thankfully, all went well and now it is finished, stitched together, and washed. I call it Bronze because… it cannot be called Silver in this color, right? What would I change if I knit it again? First, the armholes. I don’t think they are deep enough. And there are 4 weird remnant stitches from the rice stitch border that have no business of being there. If you make this pattern, decrease them while shaping armholes. The sleeves would look better when you put them in. One more thing. My yarn is exceedingly soft and stretchy (it’s 50% cotton). Yes, the cables give it some shape and keep it in place but still. Use wool, or something stiffer, not too stretchy. And make it one or even two sizes bigger (with sleeves your normal size) and 2-3” shorter (if you are, like me, not tall). My second January project was Ivory by Helga Isager. I decided to make it the minute I saw it for the first time – it looks, as Kim Hargreaves usually describes it, elegant, classy, and understated. Moreover, the possibilities of wearing this little jumper seem to be endless. It would look great with everything – a skirt or a pair of pants, under a cardigan or without it. While in London, I bought some yarn specifically for this project – Debbie Bliss Fine Donegal. Yes, I’ve had many problems with Debbie Bliss yarn before, but I decided to give it a try one more time. The yarn looked practically edible – tweedy and silky, the color of oatmeal with little brown and black specks. Perfection! I wanted to make Ivory and this cardigan (that was never finished because I ran out of yarn) ready for our trip to New York. But, as it frequently happens with plans, a lot of things went wrong. First, as I already said, the cardigan wasn’t finished. And instead of unraveling the finished parts and starting over with another pattern I decided to knit Silver. Because… well, who wouldn’t? And I felt cheated of my perfect cardigan and angry at my own stupidity, so, yes, I just tried to push this major blunder out of my conscience. Then, I started Ivory since it seemed to be such a simple straightforward pattern. Wrong again! If you are looking for something mindless to make this is not a project for you. True, up to the armholes there is only reverse stockinett, but as soon as armhole decreases start the directions get more and more obscure. Actually, I don’t mind complex patterns. The best patterns are usually not that easy. What bothers me though it’s when a pattern is not explained well and you as a knitter have to decipher directions like an ancient papyrus. One of the knitters who also had problems making Ivory thinks that it was translator’s fault. She may be right and some things were lost in translation, but the layout of the pattern is determined by a tech editor. And there was a major trouble with the pattern’s layout. Things that are supposed to happen “AT THE SAME TIME” are explained on different pages and it was rather an acrobatic trick to actually follow directions and knit AT THE SAME TIME. The front has eyelets at neck opening and shoulders. Plus you make decreases for armholes and a neck opening. Everything is explained and the math is there but it is given in four separate chunks on different pages and thus gets confusing. 4) eyelets on the right shoulder from row 135 (=Row 1 (RS) on page 44) till row 141 (= Row 7 on page 44), then continue with eyelets from row 142 (=Row 8 on page 44) till row 165 (= Row 14 on page 44 second column). Mirroring the eyelets for the left shoulder wasn’t easy as well, so it took me a while to get through this unexpected hurdle. Plus I got sick with flu and wasn’t knitting as much as I usually do. Anyway, I managed to finish only the front and back before our New York trip. Actually, instead of finishing a sleeve I decided to put the pieces together and deal with the neck edge instead. In the original pattern the neck opening is worked up with a crochet hook. From the beginning I knew that I needed to find another solution. I don’t like crochet finishes on knitted garments except in folk costumes. In my opinion, they look too much like arts and crafts, an easy way out when you want to cut corners and cannot really bother with finishing. So I spent several hours experimenting with different finishes till I found the one that I liked the best - picked up stitches around the neck opening + 6 additional sts for the buttonhole and made 4 rows in reverse stockinett. I sewed down my pearly button the wrong side up – this way it blended better with the fabric. I was determined to get to the point where I really liked my neck opening and am proud to tell you that I did. Since I spent so much time on the neck edge I didn’t finish Ivory before our trip. Sleeves were knit while we were traveling and in New York. 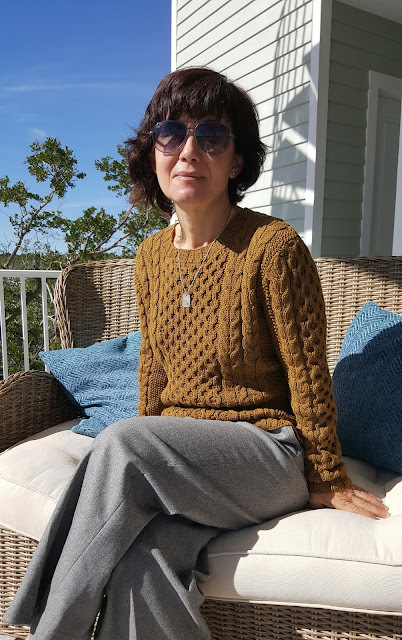 I made them long because 1) I had enough yarn left; 2) I thought that I’ll have more use of a wool jumper with long sleeves than of one with short sleeves. For each sleeve I picked up 57 sts and made increases in every 14th row 8 times = 73 sts total, as per pattern. When we came back and I finally washed the sleeves they looked too narrow to me so I blocked them rather aggressively. Big mistake! They stretched too much and stitching them together was a nightmare. Plus they became too long and wide for my liking. Unravelling and knitting them again wasn’t an option so I put both sleeves under hot water for a while, shaped them as best I could and let them dry. You can see on the pictures that they are still a little too loose at the top but otherwise fit me well. Some knitters noted on Ravelry that there are too many things going on at the front of Ivory. I disagree. In my opinion, everything that is going on there has a right to be there. This top is feminine and versatile and can be a staple in any wardrobe. I might even knit it again. Next time with short sleeves and in a brighter color. Just for fun. Overall, I am pleased with my January projects and I hope to wear them for many years. If you are interested in needle sizes and yarn requirements, you can find all the specs for both projects on Ravelry. I described the process of making them in such details so you can avoid my mistakes and be totally zen while knitting these patterns. 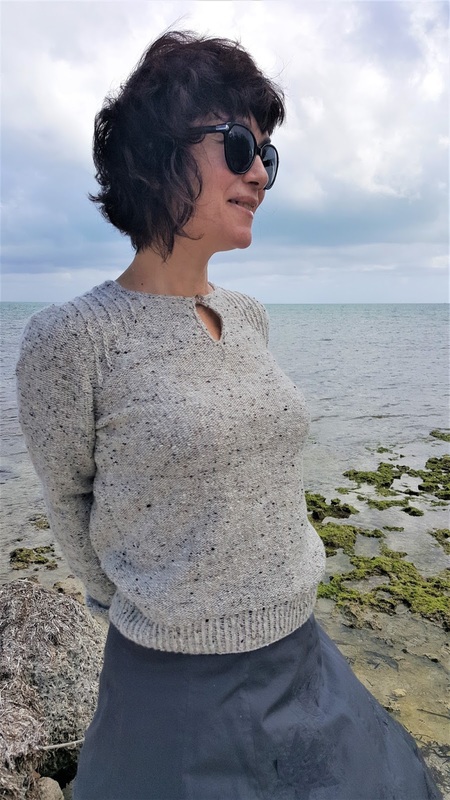 I enjoyed reading your thoughts on process vs FO knitters -- I am both simultaneously, and perhaps FO knitters have to be also process knitters, no? Anyway, beautiful sweaters! Yes, I agree, it depends on circumstances and or mindset, but the process is always the most important thing. And thank you!